I know what you’re thinking. Green beans cooked well past crisp-tender is unideal; their sodden, saggy skins remind you of bad leftovers and TV dinners, an accident, not something you would set out to make. Yet though they might not snap in that satisfying way, slow-simmered green beans retain an impressive structure, plumped with juice and fat from olive oil, and all the flavors therein, transforming into something very different, but still mildly sweet. And in case I’m not waxing poetic enough, it’s something to appreciate all its own, preconceptions about how beans should be aside. It’s also a good season to get back to slow-braising and simmering things on the stove. It dropped about twenty degrees over the weekend, but I’ve still got some summer produce from previous weeks’ CSA shares. 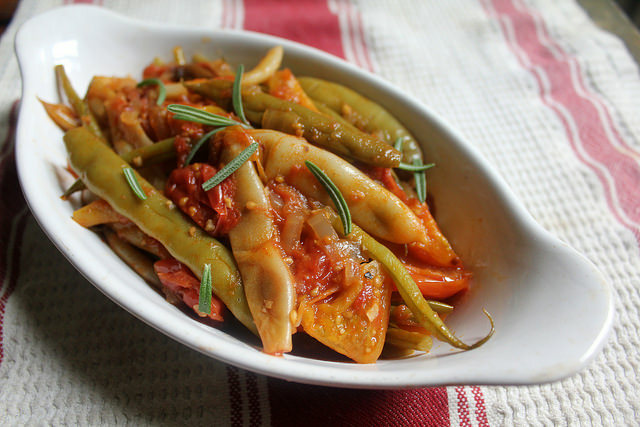 I was aware of an oldschool Italian way of simmering green beans very slowly in a tomatoey braise, a homestyle tradition learnt through old cookbooks and the occasional mention here and there. But that’s not really how I came by making this versatile little side dish, actually. That trajectory began with a friend’s going-away from NYC party. He is originally from Texas, so the party hostess had planned a menu of pulled pork and collard greens, mac and cheese and cornbread, and she asked me to make an appetizer or vegetable-forward side. I had settled on succotash, since I had so many lovely beans, tomatoes and late-harvest sweet corn on my hands; but the corn went gross before I could strip it, and bell peppers were scarce by then. I began by sauteeing something. I wasn’t sure what. 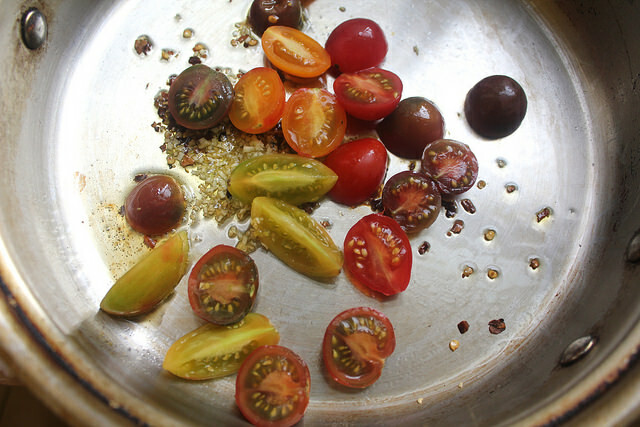 Little heirloom cherry tomatoes and garlic seemed a good start to whatever it was. I added chili flakes and then capers and soon it was a party of aromas in my kitchen. I suddenly wished I had saved my eggplant in order to make caponata, the saucy, tomatoey spread of sorts for crusty bread. 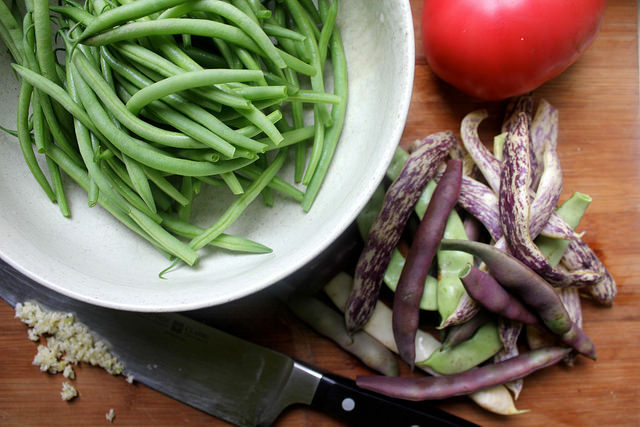 But I did not have eggplant; instead, I had green beans and speckled purple, yellow and green romano beans, which I intended to use somehow. Thinking in terms of caponata, it all came together. But these beans really took their time to cook until tender. 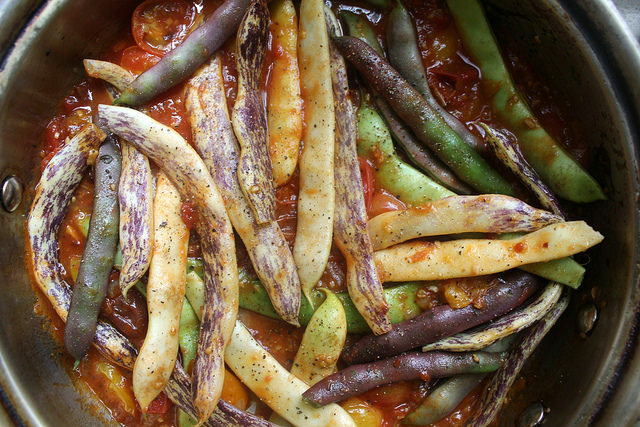 I added the thick, wavy-shaped romano beans first, then a clutch of skinny green beans after about 20 minutes of simmering the others with its tomato infusion. For the party, I wound up using scissors to cut most of the beans to bite-size pieces and put the whole shebang into a wide-mouthed mason jar to serve along with slices of crusty French bread. People liked it. 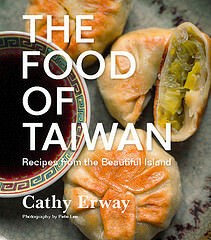 They didn’t know precisely what it was they were spreading onto bread or into their mouths and bellies, but they liked it. And when they asked what it was, I told them more or less the whole story that I wrote above. Trim the beans and set aside. Heat the olive oil and add the garlic and onion. Cook on low heat for 5-6 minutes, or until onions are translucent. Add the tomatoes and cook for another 5-6 minutes, stirring occasionally. Add the chili flakes, capers, and tomato paste and stir to combine thoroughly, about 1 minute. Add the olives and green beans (or just the romano beans and not the skinny green beans at this point) along with a pinch of salt and pepper. Add enough water to just cover the mixture and bring to a boil. Reduce heat to a low simmer and cover. Let simmer 20 minutes covered and open to stir (add the remaining skinny green beans at this point and stir to combine thoroughly). Add a small amount of water if the mixture appears dry, stir, and cover for another 20-25 minutes. Remove cover and taste; add salt and pepper to taste. Stir in the fresh herbs and let cool a few minutes before serving. Four maple leaves: It’s as good as it gets for a hearty, tasty, bread-slathering-worthy side dish. This veggie side satisfies meets all those dietary restrictions and complements just about any main dish, too. With protein from the beans and heart-healthy olive oil as its only fats, you have little to lose here by eating it as a main course instead. 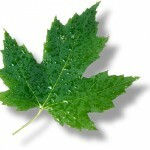 Seven maple leaves: As a plant-only dish—a side dish that could probably be elevated as a main dish somehow—you can be assured that its carbon toll is naturally low. Except for the olives, capers, and olive oil that may have been imported (or at least shipped to your East Coast abode from the sunny, olive-loving West Coast groves). 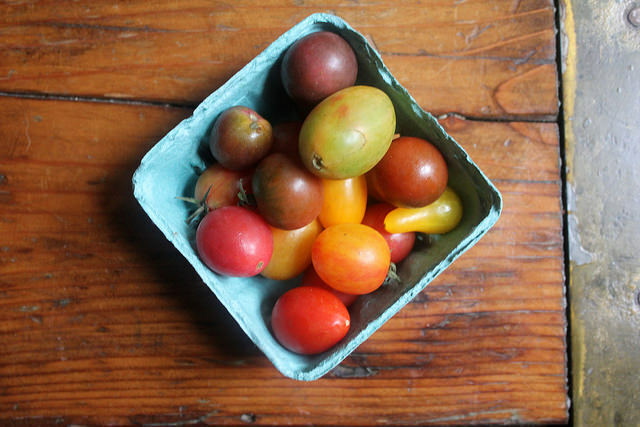 Best way to get the most green points for your buck here are to use almost-bad, squishy tomatoes and sort-of wilting green beans, since they’ll be cooked to death and their texture won’t matter anyway. One of the healthier dishes on the menu that day! Surprisingly delicious and very easy to make! It also keeps well. Since learning about lathera (vegetables slow-cooked with olive oil and tomato) we’ve been enjoying them often as either a main dish or side. Love this recipe – so rich with flavor! This setting provide functions how to enable the hey cortana and also to know much better to use it in our PC.